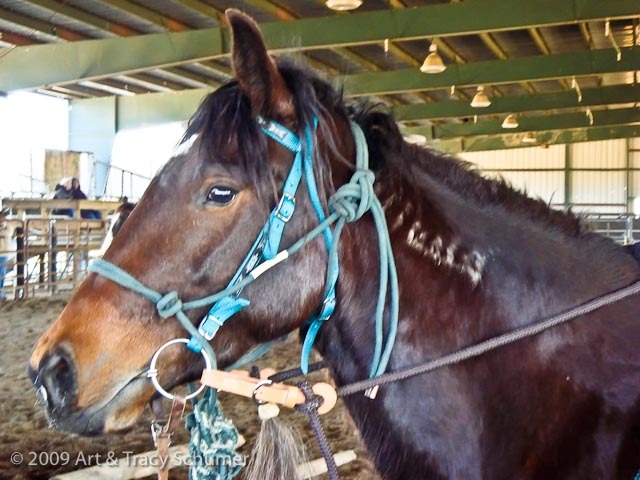 The sheer fact that a clinician has hung out their shingle in the realm of professional horsemanship leads folks to believe the shingle hanger is an experienced, expert horseman. Sadly, this is not always the case. Some clinicians are better showman than horseman, others are neither expert horseman nor all that experienced just gifted talkers. In recent years, opportunities to make good money traveling around teaching admiring crowds aspects of horsemanship over a weekend have attracted all types from all over the world. Somehow having a foreign accent seems to give a clinician more credibility in the U.S. But observant horsemen often see through the fluff and into the core of the issue. For the past two decades I’ve had the pleasure and privilege of seeing many different clinicians in action across several disciplines. Most of the time I got my money’s worth, other times not. But either way, I came away learning something important, whether it was related to horsemanship, horse behavior, physiology, the clinician conducting the course, or most importantly myself. On rare occasions I witnessed something amazing; extraordinary even. A sunny spring afternoon in rural central Florida, some years ago. Ray Hunt was neck deep in the middle of a large clinic. At the time he was still recovering from surgery after losing a lung. I’m sure his doctors would have been horrified had they seen him in action that weekend. There were eighteen raw colts entered in the colt starting class and thirty-six riders in the horsemanship. Over three hundred spectators crowded the rails for each of the four days the clinic took place. This was a tremendous load for the old horseman but people had paid their money and Ray was determined to work for it. Day three, just before the lunch break and Ray had been working fresh colts carrying anxious riders all morning. His labored breath blew over the sound system, making it seem as if he was trying to teach in a howling wind storm. By chance or by luck, word came that a late attendee had finally arrived after spending the morning at home trying to load her horse into her trailer. Ray stopped what he was doing and asked the crowd if they would like to come over while he helped this lady work at getting her horse to load better. Without a word it seemed, the spectators flowed out from the arena and into an adjacent open field. It’s often been said (with a wink) that Ray Hunt could load a horse over the phone. On this day, he loaded a horse with his mind. Ray walked purposefully but slowly over to the horse he was going to help. The crowd fanned out close behind him. The owner’s trailer was a modern aluminum slant rig with a large wide door. Her horse was good sized; around sixteen hands tall. Ray observed the situation and determined that it would not help this lady to have her horse only be able to load into her nice big rig. He needed more of a challenge for the horse if this deal was to stick. Ray asked the crowd for a different trailer, “does anyone have a little two horse trailer we can work with? The smaller the better.” Somebody spoke up and in short order a quite stunted, hard top side-by-side was moved into place. It took Ray about twenty minutes to load this horse the first time. The tall bay mare had to duck her head in order to squeeze herself into one of the trailer’s two narrow slots but with encouragement from Ray she did it willingly. The audience waited, they knew this was only the beginning. Ray left the horse inside the trailer for a minute or two and then unloaded her. He repeated the process until about a half an hour had gone by and the mare had loaded up easily, it seemed, about a dozen times. Then Ray lead her away from the trailer, circled back and simply tossed the lead over the mare’s back. The big mare continued on her own the last few feet, rounded the corner and loaded herself. A gasp of excitement emanated from the spectators. The horse’s owner stood nearby watching with amazement. Ray then pulled the horse’s halter and slipped a lariat loop over her head. By this time, Ray was looking tired and hungry but the spark in his eyes said everything. A fresh toothpick gripped between his teeth, he sat down on the tongue of the stubby pumper-pull’s hitch and simply fed out the rope as the horse walked on her own around to the back of the trailer and loaded up. Onlookers were giddy at this point- they couldn’t get enough. Ray then asked the owner to load her horse. He put the halter back on and within minutes the woman had her horse loading into the squatty two-horse just as easily as Ray had done. She even tossed the lead over the mare’s back and watched amazed as the horse loaded herself. Just to be sure, Ray then had the woman load her horse into her own trailer; which she was able to do effortlessly. The owner said later that after hours of struggling to get her mare loaded for the clinic, neighbors had come over with ropes and hoisted the horse into the trailer with sheer force. Ray said that he was aware of what had taken place at the owner’s house because the horse, though her behavior, had told him everything. Texas based clinician Joe Wolter was born in California. He grew up in the small town of Grass Valley. As a youth he developed a diverse background with horses ranging from the Thoroughbred racing industry to hunter jumpers but his true desire was to work the big outfits and be a cowboy. His dream came true when he got the opportunity to work for Ray Hunt. Joe spent several years riding with and working for Ray. He’s also a member of a select fraternity who had the privilege to learn directly from legendary horsemen Bill and Tom Dorrance. 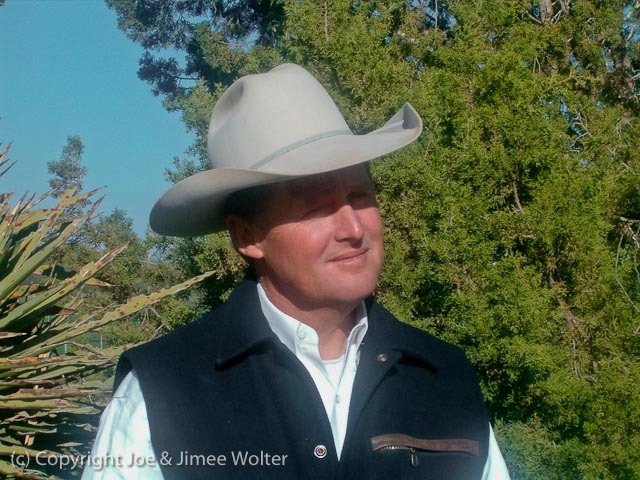 Joe Wolter’s trademark is his relaxed easy style and highly sensitive approach to both people and horses. His positive attitude makes him a popular teacher, trainer and clinician. 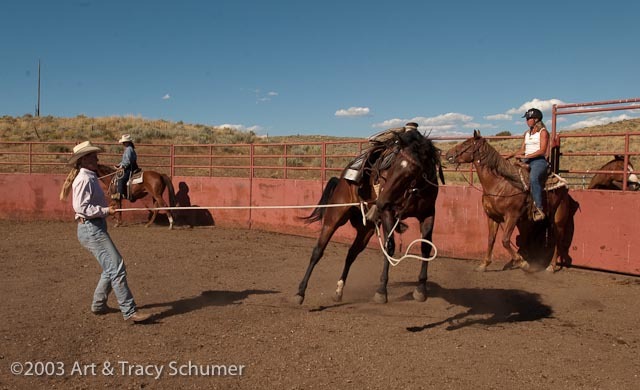 A passionate ranch roper, Joe often incorporates roping and cow work into his clinics. 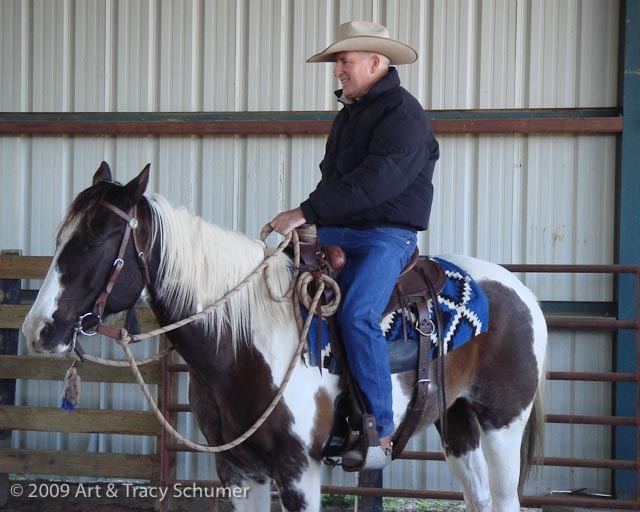 I rode in a horsemanship clinic of Joe’s in 2003. 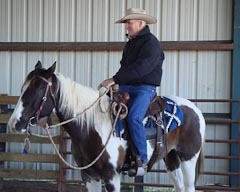 My husband Art rode his good gelding in the same class. A friend had signed up as well, I convinced her that the experience would be worth the cost. She’d been having trouble controlling her mare under saddle and felt the solution lay in finding the right bit. To be helpful, I brought along a variety of bridle rigs for her to experiment with over the weekend. Nothing I offered seemed to satisfy my friend however. She felt her horse wasn’t paying attention no matter what head gear she used. She said her horse was too distracted by the large audience and commotion inside the covered arena. My friend was clearly frustrated and I was worried she would be disappointed that she came. The clinic was held at the college of agriculture on the campus of the University of Florida and it was pretty crowded and noisy at times but it’s a beautiful facility with nice footing. He asked her if he could show her something about her horse and my friend agreed. She got off and handed him the reins. Joe stepped up onto the mare and rode her around the arena on a soft light rein. All this time my friend had been holding a tight grip on this horse’s mouth, never allowing her mare to have a moment of release out of fear she would bolt. Joe continued riding, loping easy circles on a long draped rein; the mare was relaxed and quiet. My friend was amazed, she watched silently, her hands cupped over her mouth. The whole facility went silent, the only sound being the mare’s steady breathing and muted hoofbeats as she moved out at a nice pace. After working the mare for about ten minutes Joe asked the horse to stop, he reached out and gently slipped the bridle off her head and hung it on the saddle horn. The mare licked her lips, shook her head and relaxed again. Then, with nothing but a bridle rein draped around the mare’s neck, Joe loped off with her once more. It can be a grueling lifestyle for the successful clinician. A full schedule means money in the bank but it often requires months on the road hauling from one town to the next like some kind of cowboy traveling fair. The pace can wear even the most stalwart professional down which can cause an otherwise good horseman to become jaded, impatient and irritable. It’s usually about this time that something unexpected happens and given the right conditions, even the clinician himself is taken by surprise. An exception is the ever quiet, ever patient, always positive, Mr. Bryan Nuebert. Bryan is an excellent trainer and clinician, he’s not as well known perhaps as Pat Parelli or Buck Brannaman, but given the opportunity, I would imagine that even those two men would give a hat tip to Mr. Neubert. A life long student of the California bridle horse, Bryan Neubert grew up in Salinas, California, and by chance, had the good fortune of living next door to Bill Dorrance. As a teenager Bryan began to ride seriously under the tutelage of Mr. Dorrance, spending every waking hour learning everything Bill was willing to teach him from starting colts to braiding rawhide. Later, Bill introduced Bryan to his brother Tom Dorrance and another one of their friends, Mr. Ray Hunt. All three men would become mentors to young Bryan and over the next several years, they taught him their own special brand of horsemanship. Later as a young man, Bryan, like Joe Wolter, also went to work for Ray Hunt; the men were all close friends and spent a lot of time together. 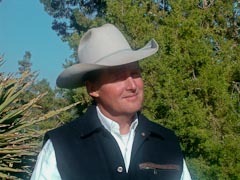 Bryan Nuebert has a natural ability with horses, the fact that he had the help and guidance of three of America’s most legendary horsemen for a large portion of his life makes him truly unique amongst his fellow practitioners. He’s one of the few pure direct links to Ray, Tom and Bill, who are all sadly now gone. Lady Lake, Florida, 2009; a cold January weekend and another exciting clinic. The event was sponsored by the delightful Barb Hall, a long time breeder and trainer of Standardbred horses. Now in her seventies, Barb still rides colts. Bryan Neubert was in the instructor’s seat. Amongst his many skills, Bryan holds a special place in his heart for Mustangs. 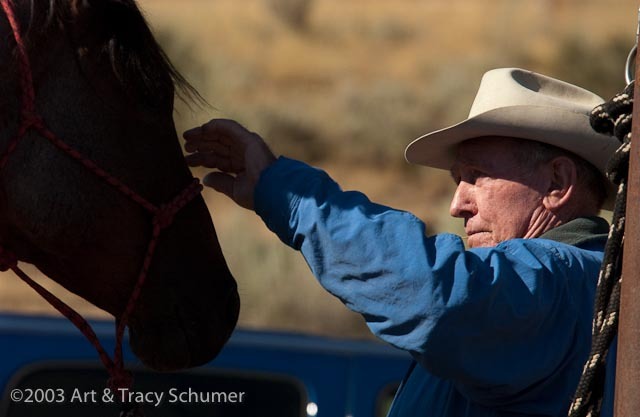 He spent time working wild horses in Nevada and has been the expert adviser to published articles on the subject of wild horse handling. This was my second clinic with Bryan but my first opportunity to see his Mustang skills first hand. Following the standard schedule, the clinic’s morning session was reserved for the colt class. It was the first day and participants were all gathered and ready to begin the weekend course- all but one. One of the colt class riders had phoned with the news that she would be running late. Her horse was giving her trouble but she assured Bryan that she would be there before lunch. The colt class began minus one horse and rider team but everything went well for the rest of the participants. I’ve seen dozens of colt classes over the years, it takes a high level of confidence and an uncommon level of expertise on the part of the clinician to safely handle a round pen full of novice horses and in many cases, the novice riders who are sitting on them. It’s a sorry fact that some folks watch a colt class just to see who gets bucked off. But it’s rare to see a class where somebody doesn’t come off at least once. Occasionally a colt class, especially a particularly full one, can look more like a wild horse rodeo than a course in colt starting. But generally speaking, everyone comes out ok on the back side; horses and humans. Bryan’s class was no rodeo, as a matter of fact, throughout the morning things were so quiet that a person would have probably seen more action at a ladies’ afternoon Bridge Club. But for people who were paying attention, it was jam-packed with good horsemanship. About an hour before the lunch break, the serenity that had defined the morning session was suddenly disturbed. A loud thrashing commotion was heard coming from outside the arena. A truck and trailer rig was maneuvering through the parking lot. It became quickly apparent where the sound was coming from. There was a horse inside that trailer and this critter was in a very sour mood. The unseen animal was kicking the sides of the trailer ferociously. The thunderous crashing sounds emanating from inside the trailer were punctuated by the loud screaming whinnies of a horse who was clearly unhappy. Bryan was not only calm, it was as if a sly grin wanted to take over his otherwise serious expression. I think if a person were to ask him directly, he would say that the arrival of that trailer meant that the best part of his day was about to begin. The trailer was backed up to the entry gate of the arena and the rear door was unlatched. Out popped a hurricane of a horse- a true wild Mustang. 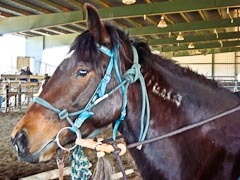 She was an older mare, fresh out of the the U.S. government’s Bureau of Land Management (BLM) Mustang adoption program. Big, bay in color and bearing a government issued bright white numbered freeze brand on her neck- she looked to me like she had some draft blood in her as she was pretty heavy boned. Bryan had the other colt class members move their horses outside of the round pen so he could work with this mare directly. Mustangs, or any feral domestic horse that’s lived out on his own, revert to their natural instincts of survival. This is why many people who buy horses at BLM sales have problems working with them. They don’t recognize that, unlike most ordinary domestic horses, the wild horse’s natural flight instinct is right at the surface- at the top of his agenda so to speak. It takes a special person, willing to spend the extra time necessary to bring a wild horse back to a domestic state of mind. It’s all too easy to trigger the flight response in a wild horse. With their heightened instincts of survival against predators, it’s just as easy to get yourself hurt. This Mustang mindset, tuned to the survival channel, has unduly earned these horses a poor reputation. This is where Bryan Neubert’s experience working with wild horses paid off- he understands the mindset and knows how to turn it to his advantage. Calm and quiet- Bryan’s movements around this mare were nearly imperceptible. I’m sorry to say, he was so quiet with this mare I can’t even really explain what it was that he did! What I do know, is that he very quickly established a clear line of communication between himself and the horse. He created an atmosphere whereby the mare began to look to Bryan for leadership after only about twenty minutes of working with her. He made himself into an island of safety, where the mare could take refuge from this strange world she’d found herself in. After only a little over an hour of working with her, Bryan put a saddle on her. What was truly amazing is that Bryan Neubert had this big mare saddled and she hadn’t even broken a sweat- she wasn’t even breathing hard. He never ran her around the pen, he didn’t flag her or rope her. He read a delicate situation correctly and kept that mare right in his bubble. After he got her saddled he worked with her some more from the ground and then maneuvered her over next to a fence panel of the round pen. Then Bryan did something incredible; he got on. The mare was accepting and allowed Bryan to sit on her for a bit, then he stepped back off. That morning’s colt riding session had been completed. Horsemen like Bryan Neubert and Joe Wolter don’t do these kinds of things to show off- they do them to show people what’s possible. Are clinicians great horseman? Perhaps the real question is, should clinicians be great horseman and to that, I say absolutely. This is far more interesting and productive a conversation to have than to chatter on about which clinicians produce the slickest videos, have the best product marketing or get the most money from their certification programs. With the current economic situation in the US, a lot of the average guys will be trying to get their old day jobs back anyway. Now more than ever, people know there’s no sense spending good money for less than excellent instruction. They just sometimes have trouble identifying excellence. Hopefully clinicians like Bryan and Joe will stay with the program and people will continue to have the opportunity to learn from true masters. As an epilogue, the bay Mustang mare was ridden successfully in the colt class by her owner. The lady rider did come off once during day three but it wasn’t serious, she hopped right back on and rode out the rest of the clinic; finishing on a positive note. Comments for "Are Clinicians Great Horseman?" I was at Bryan’s clinic and saw him work with that dark mustang mare. It was a good day for the mare and a great day of learning for everyone else. I’ve ridden under Ray, Bryan, and Joe. All are fabulous and everyone should make an attempt to saddle up with them. It will change your life.